Bio Active Protein And Peptides Market Segmented By Key Players - Archer Daniels Midland Company (ADM), Kerry Group, Cargill Inc., Omega Protein, Bunge Ltd., E.I. Du Pont De Nemours and Company, Fonterra Co-operative Group Ltd., Royal DSM, CHS Inc, Others. There is a steady adoption of bio active protein and peptides among consumers worldwide seeking nutritional and healthy food. Revenue from the global bio active protein and peptides market is expected to grow 2.2X by 2026 as compared to 2016 end. The market is anticipated to grow at an attractive CAGR during the 10 year forecast period of 2016 to 2026. An aging population and increasing incidence of chronic diseases is fueling the demand for bio active protein and peptides in the global market. Also, a growing preference for bio active protein and peptides in cosmetics and personal care is likely to boost the global bio active protein and peptides market over the forecast period. Increasing disposable income coupled with increasing per capita food expenditure is another factor likely to positively impact the growth of the global bio active protein and peptides market in the next 10 years. However, stringent rules and regulations leading to increased operational costs and supply chain issues create a barrier for manufacturers operating in the global bio active protein and peptides market. The global bio active protein and peptides market is likely to witness certain trends in the coming years. Plant source ingredients are expected to gain traction in the near future and manufacturers are focusing on producing easy-to-digest protein using advanced technologies. The Plant Source segment is anticipated to hold a market value share of 45% by the end of 2016 and is expected to register high Y-o-Y growth throughout the forecast period. Plant source bio active protein and peptides such as soy and pea are getting prominence in the marketplace due to an increasing consumer preference for meat-free diets. Avoidance of meat is rising for various health, sustainability, and ethical reasons. Moreover, plant source bio active protein and peptides are generally 20% – 30% less costly as compared to animal source bio active protein and peptides and are hence widely accepted by manufacturers for the ease of extraction process. 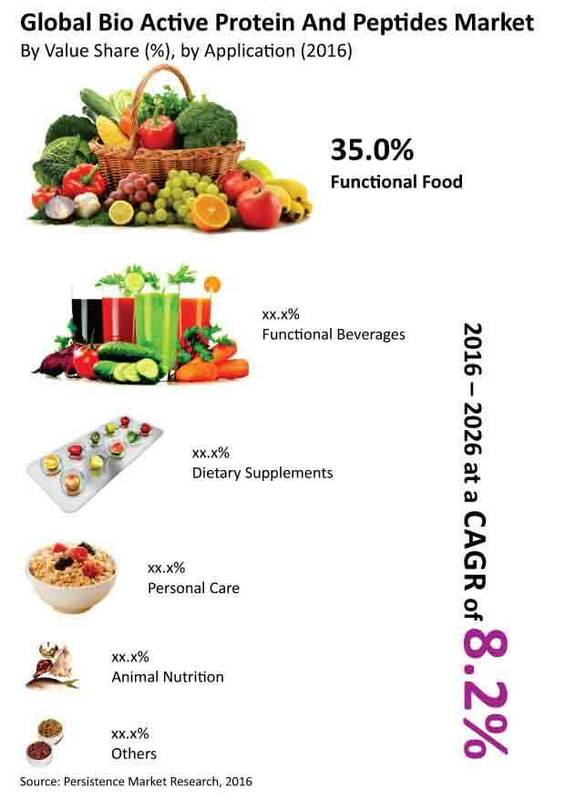 Owing to the increasing physiological benefits coupled with increasing consumer preference towards vegetarian food, the plant source bio active protein and peptides segment is expected to get prominence over the animal source bio active protein and peptides segment in terms of revenue growth during the forecast period. By application, the Functional Food segment is expected to be the most favored application for manufacturers operating in the global bio active protein and peptides market. However, the Functional Beverages segment is expected to gain higher traction than the Functional Food segment by 2019 end. The Functional Beverages segment is expected to register high Y-o-Y growth throughout the forecast period. Revenue contribution of this segment to the global bio active protein and peptides market is expected to register a CAGR of 8.3% during the forecast period. The global bio active protein and peptides market is segmented into the seven key regions of North America, Latin America, Eastern Europe, Western Europe, Asia-Pacific Excluding Japan, Japan, and Middle East & Africa. North America dominates the global bio active protein and peptides market and is expected to represent an incremental $ opportunity of US$ 16.8 Bn between 2016 and 2026. North America is a rapidly growing bio active protein and peptides market owing to increasing demand for sports and nutritional food. Consumers in North America are highly focused on their health and fitness. Also, due to busy lifestyle and work culture, consumers in North America are opting for ready-to-eat and ready-to-drink food and beverages, which has given immense scope for manufacturers in the North America bio active protein and peptides market to develop products specially catering to the functional food and beverages segment. Archer Daniels Midland Company (ADM), Kerry Group, Cargill Inc., Omega Protein Corporation, Bunge Ltd., E.I. Du Pont De Nemours and Company, Fonterra Co-operative Group Ltd., Royal DSM, and CHS Inc. are some of the top companies operating in the global bio active protein and peptides market.